Avondale nursing graduates highly sought after. Learn from one student’s experience. Studying nursing at Avondale is an amazing and unique experience that will not be found elsewhere. In high school, when it came time to think about what I wanted to be when I graduated, all I knew is that I wanted to work in an environment where I would be able to actively help others, in a caring way, and make a positive influence in this world. Nursing is the perfect environment where this can be achieved. When looking for a university to study Nursing at, God seemed to be opening every door for Avondale. 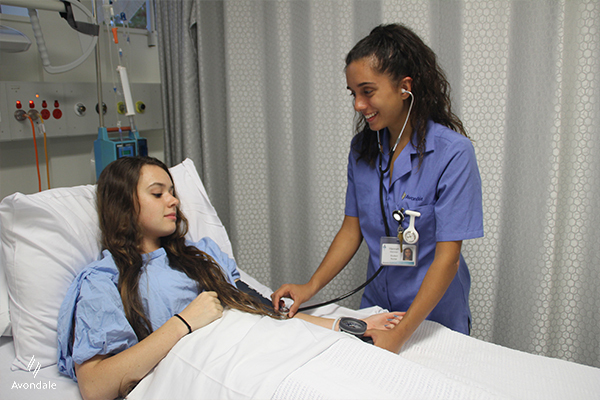 The Nursing course at Avondale has a good standing reputation in the NSW healthcare community. Upon hearing this, and how many students were coming from all over Australia to study Nursing here, I decided that I would too. I moved over from Western Australia with nothing but a suitcase and a passion to help others. With the wide range of scholarships to apply for, I was blessed to be given one which is helping to pay for my dorm fees. Living on-campus has enabled me to connect with likeminded people my age and develop friendships that I’m sure will last me a lifetime. Although I’m far from home, I have another home here. It’s been so much fun, in both social and academic aspects. Student life can get difficult however. Trying to balance assignments, exams, clinical placements, and a job can get tricky. There have been times when I have felt discouraged and overwhelmed. However, there has never been a time where I have been struggling and one of my lecturers haven’t noticed. They are all so kind, supportive, and genuinely care about our academic success as well as our mental health. They are always encouraging us and inspiring us to become the best nurses we can be. I feel comfortable to talk to them whenever I need academic help, or for a listening ear if I need someone to talk to. I am astounded as to how many of our lecturers can be this kind and caring. They keep us on track and keep our passion for nursing strong. The classes are small and intimate which allows for discussion, participation and inclusion of all students. The classroom is a positive environment where we are given an opportunity to voice our opinions and concerns. At both campuses, the nursing laboratories and classrooms are well organised and equipped with the best resources. Our laboratories are setup with realistic looking clinical situations in which we can practice our nursing skills which we have learnt in class. Our lecturers place a large emphasis on practical classes and laboratories to ensure we are not just gaining knowledge but learning how to apply it in clinical situations. The Sydney campus is a nursing-specific campus on the grounds of the Sydney Adventist Hospital where we are given unique learning opportunities. The classrooms, labs, and staff are all specific to nursing. We have many clinical placements in the Sydney Adventist Hospital, which is also on-campus, where we are guided by many past students and nurses that enable us to further our study. Our clinical placements are organised in blocks so that we can achieve certain objectives at each one. We are sent to excellent venues where we learn the best practice for nursing care and are able to gain experience of what nursing is all about. Where possible, the clinical staff organise placements that are near where we live, and put us with friends so that we can travel together to save fuel which makes the experience much less daunting. In the nursing community Avondale students have a good reputation. Avondale is known for having an excellent nursing course which produces excellent students in which I am proud to be a part of. The Avondale nursing course is enjoyable with great learning opportunities. My passion for helping others as a Nurse has only grown stronger, thanks to the course, my friends, and the positive influence my lecturers have had on me. I feel confident that here I am learning the skills and knowledge that will enable me to care holistically for my patients once I am a Registered Nurse.